Concoct Culinary Masterpieces with the New LG Kitchen! They say that the kitchen is the heart of the home. It’s very true, in fact, it’s one of our most favourite places in our home and we spend a lot of time in it. One thing is for sure, not only meals but, memories are made in this space. That is why you need a kitchen that is not only efficient but, one that has style in mind never hurts either. The new LG Kitchen in Black Stainless Steel does both and helps you to make meals for everyone you love efficiently. Whether you are tackling a sink full of dishes or trying to keep your meal plan on track, the LG Kitchen will help you to cook like a pro at home. All while looking sleek, clean, and beautiful. 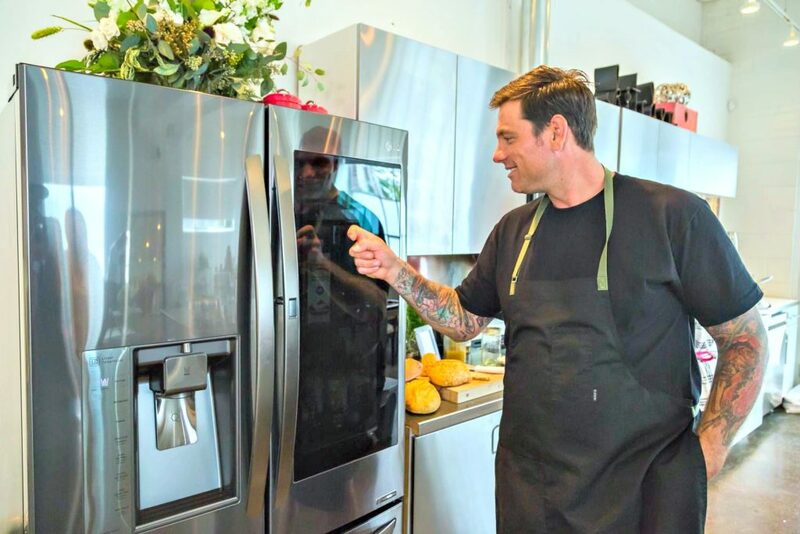 I had the chance to go to an LG Kitchen demo and play around with the new LG Black Stainless Steel series. It’s a beautiful dark-tinted stainless steel and features a satin-smooth finish for a modern design. Let me tell you, I fell in love. Not only is it gorgeous in my books but, the series has so many features that make it efficient too. Plus, the prices are very affordable for the quality that you get. Last month, LG invited a group of influencers and journalists to Toronto to experience the LG LG black stainless steel series. 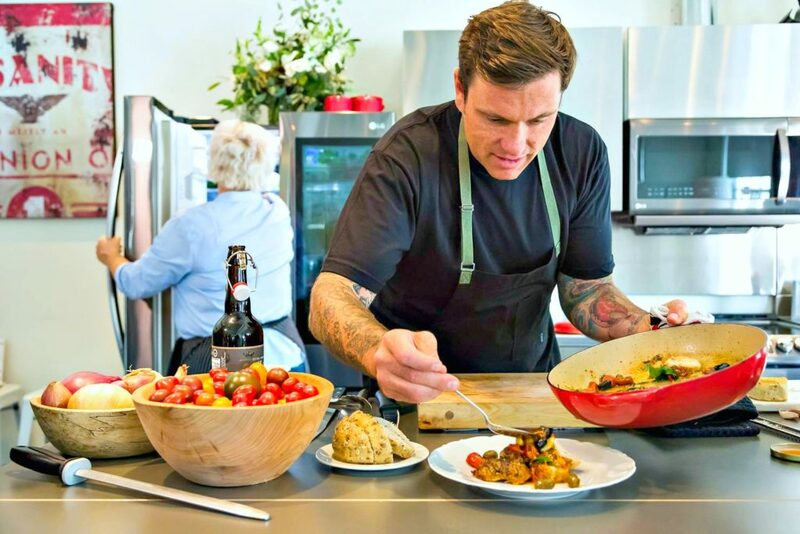 They had the opportunity to become sous-chefs with Chef Chuck Hughes and they made an array of delicious recipes. I had the pleasure of chatting it up with Chuck and he said that he wanted to make recipes that would be enjoyed by all. 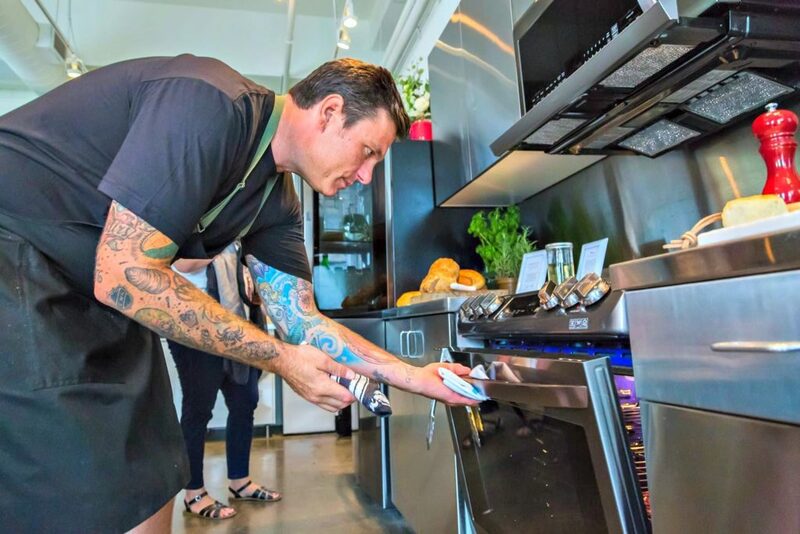 Chef Chuck was no stranger to the new LG Kitchen as he has it at home and it is no surprise that the oven is one of his most used appliances. LG’s innovative ProBake Convection™ technology is typically found in commercial-grade ovens. The new LG range moved the main heating element from the bottom of the oven to the back wall and added a multi-speed fan for optimal heat distribution. To me, it really says something if a professional chef cooks on it at home himself. The LG Kitchen Black Stainless Steel Series is not only beautiful but highly efficient. This set includes the InstaView™ Door-in-Door® Refrigerator, , the LG Electric Range with EasyClean® and ProBake Convection™, Top Control Dishwasher with QuadWash™, and the largest capacity, LG Over-the-Range Microwave with 2nd Generation Slide-Out ExtendaVent™. Where most over-the-range microwaves only cover the rear of the cooktop, this model provides powerful ventilation over the entire cooktop, back to front. If you read my post about style and trends with Jane Lockhart, you can get all of the details there! How Does Chuck Like It? I was eager to discover what his thoughts on the LG Black Stainless Steel series were. He said that he loves the InstaView™ (a Door-in-Door fridge) because you can keep the fridge closed at all times. All you have to do is knock twice, and immediately you can see what’s inside. Chuck says that it’s great for kids because it’s like they have their very own little section in the fridge. They don’t have to open the door to see what’s inside. When my kids tried it, they loved it! Not to mention, it’s fingerprint proof. That alone with kids is a feat in itself. The stainless steel is coated with a darker hue and topped with a protective coating, the LG Black Stainless Steel Series makes every appliance fingerprint and smudge resistant. A dry cloth is all it takes to get it shining again! The oven is in itself incredibly efficient. The LG ProBake Convection™ delivers even cooking, even faster. The 6.3 cu. ft. oven capacity gives you more space and gives you the flexibility to cook more dishes and larger platters at the same time. Inspired by his recent trip to PEI, he brought back some tasty flavour inspiration. Since he was in PEI, he had a lot of chowders and with every bowl, he had a biscuit. So, he wanted to recreate that and made a scone biscuit with a sweet and tangy tomato-onion jam. But, instead of going the savoury route, he went sweet. Kind of like Old Quebec grandfathers used to make. After that, he served it canape style. For dessert, he chose mini cinnamon buns. Definitely a guest favourite but, with a twist with vanilla crème Fraiche on top instead of a traditional glaze. For the main entree, he chose a recipe that can be prepared in one-pot. His goal was to make a recipe that was wholesome and easy to recreate at home. The roasted chicken thighs with fresh tomato and black olives looked absolutely delectable and were done in less than a half hour. He gathered all of the guests together and they started preparing! 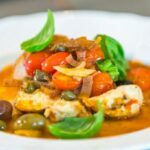 First thing is first, he started on the stovetop by searing the chicken in olive oil and adding shallots, garlic, olives, caper, fresh tomato and herbs. Then moved it into the convection oven to finish. After that, he plated it up with fresh basil, finished with sea salt, and lemon zest. He even suggested that you can switch it up and add some of his hot pepper spread from his line to give it some zing! A one-pot chicken dish with delicious flavours. Preheat the oven to 375F. Using a cast iron roaster, big enough to fit all the chicken in one layer. Pick the basil leaves, break the bulb of garlic into cloves leaving them unpeeled and then destone the olives. In the cast iron roaster, pile all the vegetables, garlic and herbs into the middle and drizzle with high quality olive oil. Season with salt and freshly ground black pepper. Place the chicken thighs on top of vegetables, drizzle with good quality olive oil and season well with salt and fresh ground black pepper. Bake in the oven, turning the chicken after 30 minutes. Jiggle the leg- if it is loose it is done. Ensure juices run clear or insert thermometer into the fattest part of the leg. It should register 165. Extra virgin olive oil or sunflower or milder flavored olive oil- see notes below. Mince the garlic. Add 1 egg, a dash of salt and a squirt of lemon juice into a mixing container for a hand held blender. Add a dash of your oil of choice. Start blending the mix as you SLOWLY and continuously pour in a thin stream of oil. The emulsion will start to form and will thicken as you add in more oil. When the aioli is thick enough, stop blending, and taste the aioli for necessary adjustments. Add in more garlic, lemon juice and/or salt to suit your taste. Step Outside of the Box! Amongst making a one-pot chicken dish and trying other yummy recipes, Chef Chuck showed guests in attendance to do a couple things that they may have never thought they could do. For example, he mentions that while cooking can be spontaneous, it does require steps. That’s why making your own mayo is incredibly easy and you may not even know it. Though cooking is all about technique, it doesn’t have to be complicated. You can make your very own mayo in minutes and all by hand! He said to have fun in the kitchen but, follow the steps to make it a hit. The also shucked oysters, which isn’t difficult but, most people have never done. Not to mention, they learned how to pickle too! Overall, it was a great workshop where they learned to try new things and step out of their comfort zone. Plus, it was a good excuse to cook easy and fun recipes that bring people together. That is one of the things that I love about the LG kitchen. It unites form and function to create efficient, yet beautiful spaces, elevating the culinary experience and using the latest technology to consistently deliver the results you want. Small things like having that extra hot rear element, 3-rack dishwasher or being able to make sure that your overhead vent captures all the steam while you cook (since it pulls out and extends) is amazing. LG kitchen appliances enable you to be the master of your own space. Whether you are a home cook or pro cook. Their form and function allow you to simultaneously cook and entertain with ease, all within a modern, stylish aesthetic. After all, the kitchen is the heart of the home and when you are cooking efficiently, it gives you more time to spend with your loved ones. I say, bring on the meal plans and I’m looking at you, holiday season! If you´re more about vlogging for YouTube and love posting cooking videos, then you can easily increase YouTube video views for your next video. For more information, visit LG.ca to take a look at their new black stainless steel series. Get social and follow them on Facebook, Twitter, YouTube, and Instagram for the latest updates! Do you love to cook in your kitchen? Note: This post is sponsored by LG Canada. All thoughts and opinions are honest and my own. 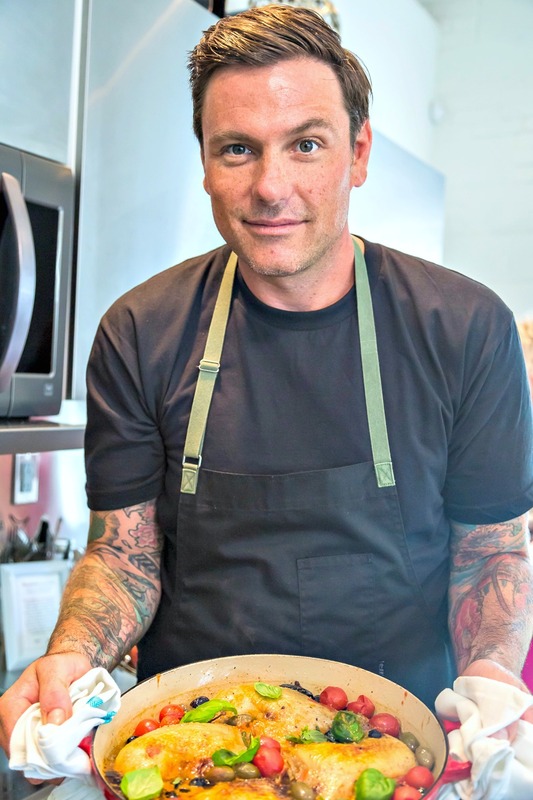 Photo Credit: Hamish Birt and Chef Chuck Hughes. I do enjoy cooking, but would love new appliances. I have seen black stainless and it is beautiful, but truthfully all of he LG kitchen appliances I’ve ever seen in stores always are. You are so right, they are gorgeous! The recipe looks amazing. The kitchen is gorgeous. This is a good combination! Happy cooking and Happy Thanksgiving! Right back at cha, friend. Thanks! I love the black stainless steel look, it’s so modern looking and really love all the new features. Those LG appliances look so amazing and would love to use them! The black stainless steel is beautiful and sleek looking! I love cooking in my kitchen but I sure do wish it looked like that! I’d probably enjoy it even more! That chicken recipe looks Eli ious too! The chicken recipe is so yummy! That new LG kitchen looks awesome. I have to admit, you had me at no fingerprints! Plus, I love that my kids can have their own space. I’m going to have to try that delicious chicken recipe. OMG me too! Wiping off fingerprints everyday can be so annoying! So I would LOVE to have a brand new LG kitchen makeover. WOW! Plus this recipe sounds delicious. The LG kitchen is to die for! I have total kitchen envy! That chicken recipe looks absolutely fabulous too!! Hehe I’m sure a lot of people have kitchen envy! This chicken recipe is one of my faves! That must of been such a great experience. The kitchen looks so beautiful! I love cooking and having the right appliances is so important. Most definitely! Life is so much easier when you have the proper equipment. I spend so much time in my kitchen and I love looking at new appliances and seeing how they can make like easier. Also loving the sleek look of these LG appliances; definitely a brand I need to look in to! Your one pot chicken dish looks fantastic too, I love one pan meals; they get me through the weeknights when I don’t have time for loads of washing up! These appliances will make your life so much easier! 1 pan meals are awesome! What a gorgeous Kitchen! That recipe had me swooning too. I am going to have to give it a try very soon! It looks like the perfect comfort food. Let me know when you do! Definitely comfort food for me! I’ve always loved the LG appliances. I keep telling myself once I buy a house that I am going to get those appliances because they are always so beautiful. LG has fantastic products! Their appliances are top notch! Definitely check it out! You’ll love the fridge! 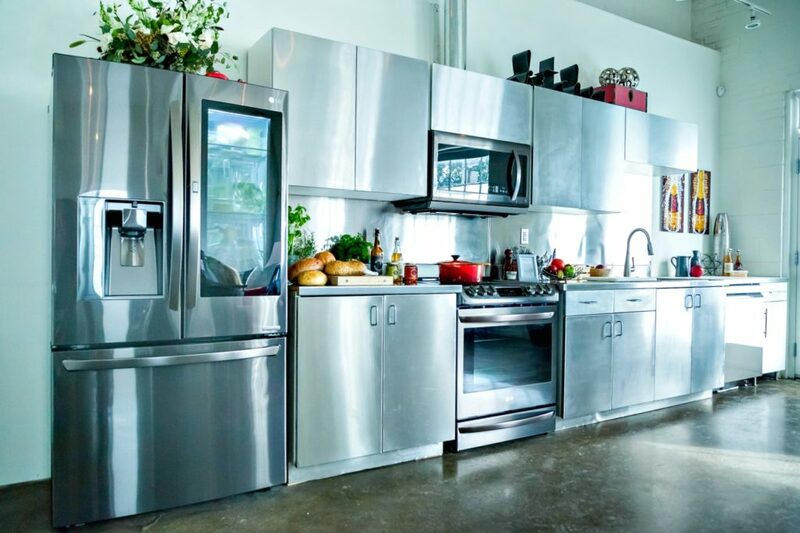 Gorgeous appliances,I would love to have a kitchen full of stainless appliances. The roasted chicken thighs sound delicious! Chicken thighs are my fave! So yummy! This recipe is right up my alley! If only my kitchen looked like that!! It’s a cooks dream come true! Oh my goodness! this looks so good! I love these kinds of dishes because they feel like home! This recipe looks good, my kids would love it! I also want that kitchen!! My kids love it! The kitchen is amazing! You’re so lucky! He would definitely put the LG kitchen to use! OMG I LOVED the kitchen and I loved the food. Everything looked amazing! Doesn’t it! Glad you enjoyed it! I love the look too! So pretty! Wow this looks deliciously amazing!!! ty for sharing this recipe! That’s fridge looks awesome! oh my, this looks so yummy! I am a chicken fan, and my husband is an olive fan, so this is perfect for us both. Thanks for the awesome recipe! Blessings! You’re welcome Claudia! Hope you enjoy the recipe! LG Appliances are awesome! I love the quality and durability of them plus the sleek design. I have wanted a convection oven forever! Yes, the design is amazing. That recipe sounds so good. I love a good chicken thigh recipe. I’d love to make it in a kitchen like that! LG appliances are so amazing. Chicken thighs are the best. SO juicy. Boy oh boy could I use a kitchen like this. The LG kitchen Appliances are gorgeous. The kitchen is the gathering place in my home. The place where I spent most my time and the place we sit and eat as a family. We nourish our bodies and souls. Yes, we are in the market for a new fridge so, I have my eye on THIS one! I would love to have a new LG Kitchen in Black Stainless Steel. This recipe looks so delicious. I will have to add it to my meal plan for next week. I am in the market for the LG dishwasher, it has great reviews. This recipe looks AMAZING! This is like my dream kitchen! And your chicken dish? YUM! I definitely have to give it a try. I think this would translate well to a baked tofu version- I love trying out professional recipes like this. Now all I need is the lg kitchen upgrade! Yes, I agree and good luck with that! This recipe looks amazing. The appliances do as well. I would love to have some nice appliances like these in my kitchen. Hopefully someday! They make such amazing appliances and more affordable than you think. Now that I have a new kitchen, I do love to cook in it. There is nothing better than having counter space, and plenty of room to work! Those appliances are beautiful! And, that recipe looks absolutely delish. The recipe is delish, for sure! Great appliances. Modern life at its best. What an amazing kitchen! The recipe looks delicious too! I have an olive tree in my yard, so I’ll have to try this using olives from my tree! This recipe looks amazing! My LG appliances have been a great companion in my kitchen! I love this stainless steel look, too! So classy! I love the finish too! I am in love with this kitchen. The black stainless steel looks so sleek. That chicken dish looks so delicious too. It is such a gorgeous kitchen for sure!